The St. Thomas Aquinas Parish Acolyte program is oriented towards the beautification, dignity, and solemnity of Sunday and Holy Day liturgies which are celebrated with greater solemnity. Acolytes are young men (age 11 through college) who volunteer on a regular basis to serve at the 9:30am and 11:30am Masses as well as any other Masses which are considered solemn and, therefore, are celebrated with greater ceremony (Holy Days of Obligation, solemnities of Our Lord and Our Lady, patronal feast days, special devotions and processions, etc.). For more information, contact Deacon Joe Diaz. Regular Updates and Formation Materials can be found at: http://stacharlotteliturgy.blogspot.com. The registration form can be downloaded here. The acolyte program is directly organized by the parish’s Master of Ceremonies who collaborates with and implements the liturgical vision of the pastor. The Master of Ceremonies is aided by assistant MCs. Together with the MC, they provide for the training of and as an example to the parish’s acolytes on a regular basis. The acolytes primarily focus on service at the 9:30 and 11:30 Sunday liturgies, though they are not precluded from assisting at other Masses. 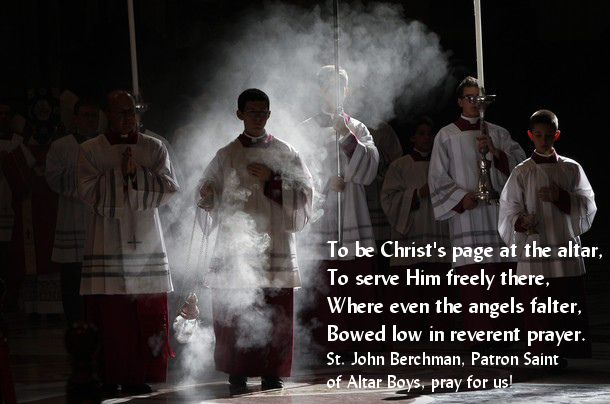 Acolytes are young men in the parish who are 11 years of age or older. Acolytes give respect to Our Lord and his sanctuary by dressing appropriately and modestly for Mass. They wear black pants, black shoes, a belt, and a shirt with a collar underneath their cassock. Acolytes’ hair should be well groomed and not fall below the cassock collar. Acolytes do not wear visible jewelry such as rings, piercings, etc. This does not include a wristwatch. Acolytes arrive at least 20 minutes prior to Holy Mass and vest in cassock and surplice. They report to the MC or one of his assistants. The veteran acolytes may be needed to assist the younger acolytes and acolytes-in-training to vest. Who may serve at Holy Mass as an acolyte? Any young man in the parish who is at least 11 years old and wishes to volunteer his service at the altar may be an acolyte. He simply needs to speak to the Master of Ceremonies at the 9:30am or 11:30am Sunday Masses, or he/his parents may contact Deacon Joe Diaz. How often are acolyte trainings? The parish’s Master of Ceremonies organizes acolyte trainings each quarter. Acolytes are asked to be at 3 trainings each year, as a minimum requirement. We worship God in a particular way by serving at Holy Mass. We strive to become holy in a particular way by serving at Holy Mass. This does not mean that servers are more or less holy or worship God more or less effectively than the priest or the congregation. This means that we worship God and become holy through the unique experience of serving Holy Mass. We also serve Christ directly in the person of the priest. When a priest celebrates any sacrament, it is Christ who celebrates! When we hand the chalice to the priest, or wash his hands, we are really serving Christ, because the priest celebrates Holy Mass “in the person of Christ, the head.” Lastly, we not only serve Christ in the priest, but we also serve the congregation. By making the responses, conducting ourselves in a worthy manner, and being attentive and careful to our responsibilities, we help the congregation to pray better. The best server is the one that goes unnoticed by the congregation; he fulfills his role humbly, discreetly, and without distraction. Why are there guidelines and rules? Serving is meant to be enjoyable and fun, but we can only enjoy something when we are prepared to carry out our responsibility. In order to attend to our responsibilities, we must be prepared physically, mentally, and spiritually. How can an acolyte prepare himself physically for Holy Mass? Physically, acolytes must look their best for Christ. It should not look as if he just rolled out of bed a few minutes before Holy Mass. This is the reason that there is a dress code explained in the Acolyte Guidelines. When he arrives, he puts on a cassock. The cassock is a garment that represents simplicity of life and service. The priest always has the option to wear it because it shows his own promise to simplicity of life and his divine service that is separate from any service that comes from the world; and that is why it is a garment that is different and separate than any clothing that a lay person wears on a daily basis. Before Holy Mass, the acolyte puts on a surplice, which reminds him of his baptism, the promises his parents made for him then, and his dignity as a child of God. The cassocks and surplices have been blessed, so acolytes treat them respectfully and never allow them to lie on the ground or fall down in the closet. How can the acolyte prepare himself mentally for Holy Mass? Mental preparation means that the acolyte must get plenty of rest before he serves so he is alert and attentive. He must leave behind distractions from home and school. He must know the particular responsibilities of his position and how he is to serve in that role. The best way to do this is to regularly look over the acolyte guidelines which explain which acolyte does what at each part of Holy Mass. If the acolyte has questions or doubts, he asks an MC or older acolyte before Holy Mass about what the duties are. Throughout Holy Mass, he must always pay attention to the priest, emcee, and his brother acolytes. How can the acolyte prepare himself spiritually for Holy Mass? Every Catholic is called to be prepared spiritually for Holy Mass; however, acolytes must set a good example of how important Holy Mass is in the Christian’s life. This means that he ought to attend Holy Mass at least once a week and on all the days of obligation, even if he is not scheduled to serve. He ought to learn about his faith at home and/or in a parish religious education program. He should attend the Sacrament of Confession regularly (once a month is a good habit). He should pray every day, at least a morning offering when he gets up and an evening offering when he goes to bed. At the church, he should pray the acolyte prayers before and after Holy Mass.